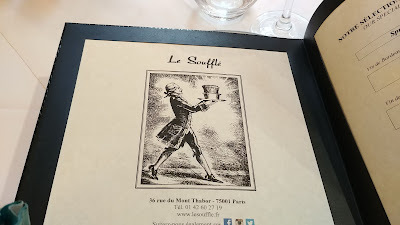 Our final meal in Paris was dinner at a restaurant called Le Soufflé. A friend who visited Paris for part of the time we were there had eaten lunch at Le Soufflé and suggested it to us. Reservations are necessary so we asked the wonderful hotel people to make one for us. There are a couple small steps to get in, but SP didn't have any problems taking me backwards up them. They were expecting us and seated us at the table next to a front window. Pretty plates with a purple flower design. We shared a bottle of sancerre and drank a lot of water since it was quite a warm day. 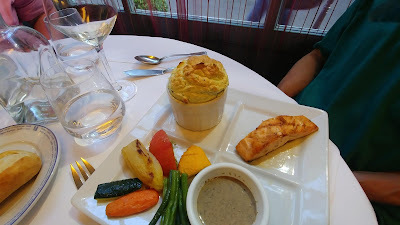 Given the restaurant's name, it's pretty obvious we enjoyed soufflé for dinner. 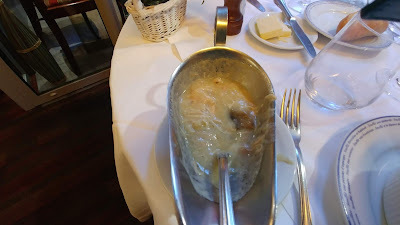 There are 2 dinner options: a 3 course fixed price dinner of just soufflé or a 3 course fixed price menu dégustation, which was more than just soufflé. Mom and I chose soufflé only. We started with a small salad next to a cheese soufflé. It was yummy, but also filling. 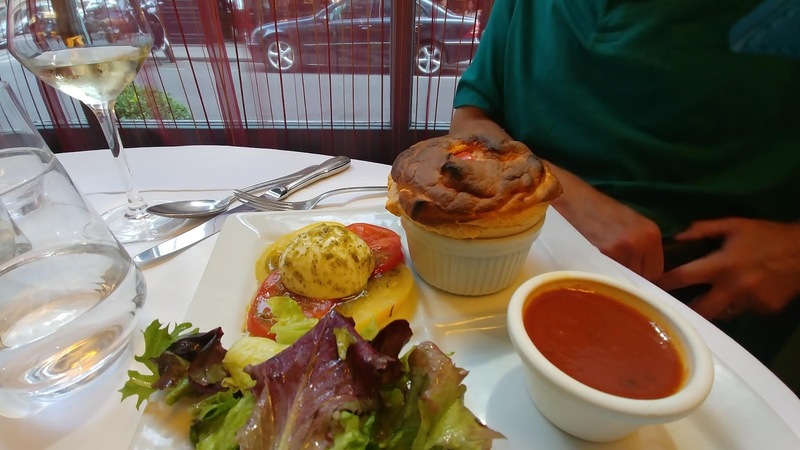 SP started with Tomato & Burrata + Tomato Basil Petit Soufflé. He said it was excellent. His soufflé part of the meal was smaller than ours, and that was key as we ate more. His main meal: Salmon and Spinach Soufflé with vegetables. He said his salmon was very tasty.. Mom and I had the Chicken & Mushrooms Soufflé. 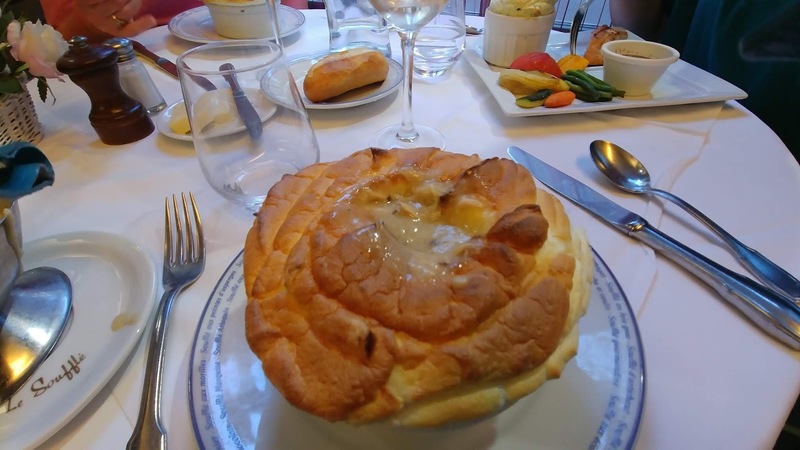 Basically, the soufflé gets poked in the middle and the sauce is spooned over the top and into the holes. The chicken & mushroom sauce was really tasty. 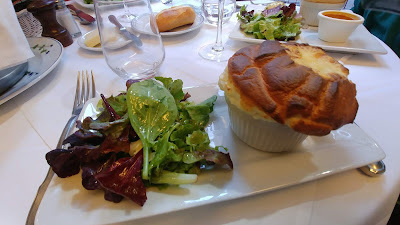 But the soufflé was so big and so much egg, especially after the appetizer soufflé. 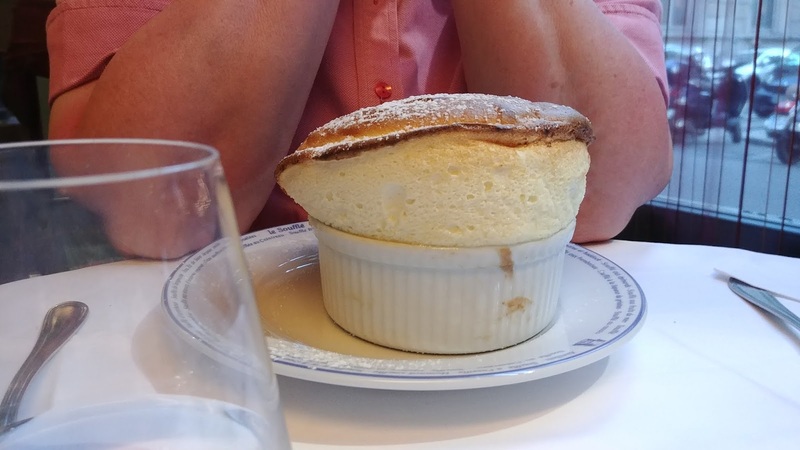 I was discovering that for as light as soufflé is, it can be mighty filling. 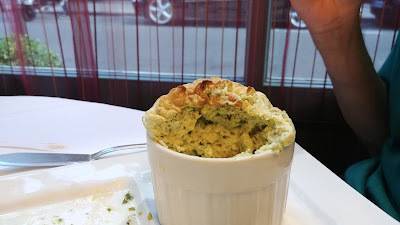 SP's smaller spinach soufflé, flecked with teeny weeny bits of spinach. 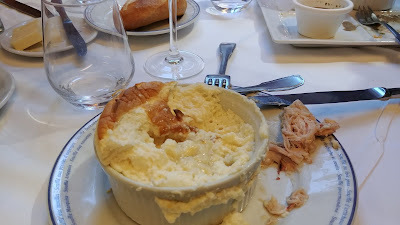 The interior of my dinner soufflé. I kept adding more and more sauce! Dessert soufflé! Look how tall that dessert soufflé is! Mom and I chose Grand Marnier, SP chose Calvados. 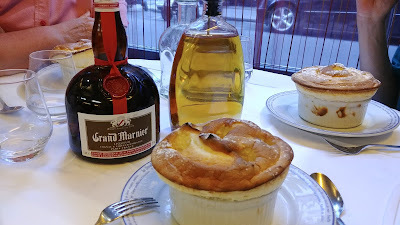 Same idea - poke the soufflé and pour the liquor on top. The booze bottles were left on the table so you could add more, if you wanted. It got a little too boozy for me! And too eggy. Also, by this point, the restaurant was full of diners, there was a lot of cooking going on, and it was hot inside in spite of the air conditioning. My mom was getting really unhappy. She had never before tried soufflé and this was just too much soufflé for her, we had to take a bus and walk to get there so she wasn't thrilled because she was tired of public transportation and walking a lot, and then she got way too hot and was complaining about how they needed to turn up the air conditioning, that it couldn't possibly be on, etc. She didn't finish her dessert and left to go outside for some relief. 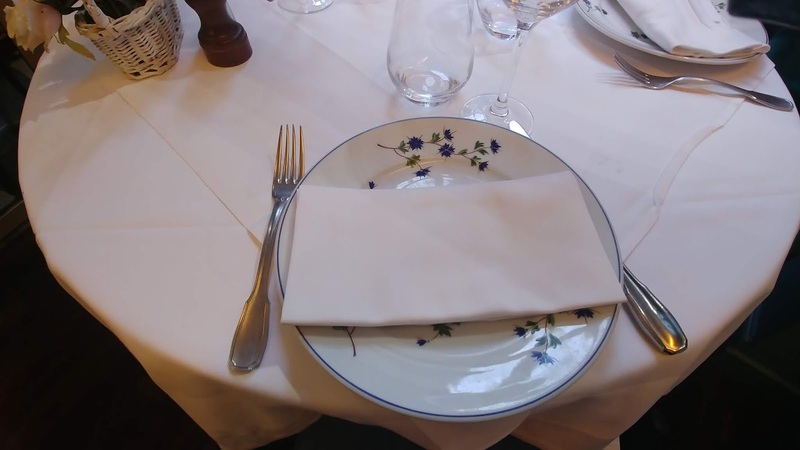 I thought the food was delicious, but next time I would choose the 3 course meal that SP chose. You still get a good amount of soufflé, but it's not overwhelming egginess. Our server was terrific and spoke English, plus there were English translations on the menu.